At Transworld Systems Commercial Division, we recognize we live and operate in a highly competitive business environment driven by results and bottom line solutions. That's why our goal is to efficiently and effectively recover our clients' delinquent business-to-business debt - resulting in improved internal A/R processes, increased cash flow and greater profitability. Transworld Systems Commercial Division has a long heritage of helping commercial entities recover delinquent accounts. A collection expert for over 44 years, Transworld Systems Commercial Division performs under the direction of TSI - Transworld Systems Inc. This relationship allows us to leverage the resources and financial stability of a leader in the ARM industry to successfully serve businesses of all types and sizes. TSI currently has over 2,000 employees and a wealth of industry knowledge to help our clients recover more while lowering their days outstanding. Let us be your trusted partner. 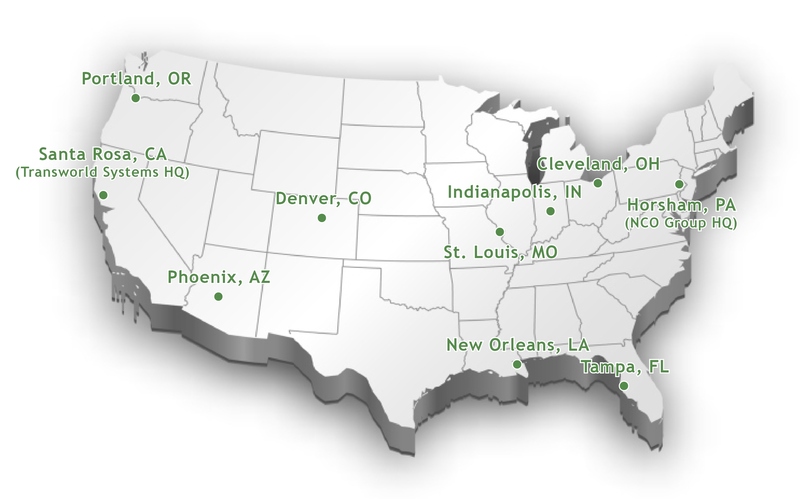 For your convenience, Transworld Systems Commercial Division maintains offices and representatives across the nation. In addition, many of our professionals operate virtually, so no matter where you are, chances are we have someone in your neck of the woods. See the map below for each of our physical office locations. Do you need assistance collecting international accounts? We can help! Contact us to learn more about our international capabilities.